TAVR Folding Stool,Set of Two,Light Weight Metal and Plastic Folding Stool,400lb Capacity,2-Pack Black,CH1001 by TAVR Furniture at RVTE. MPN: CH1001. Hurry! Limited time offer. Offer valid only while supplies last. 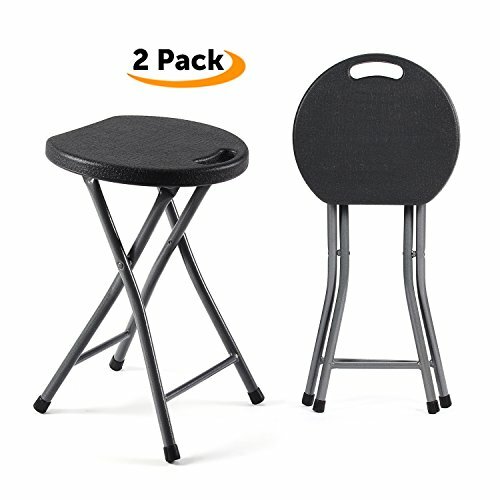 ▶TAVR plastic folding stools set of 2 are commercial grade for indoor and outdoor use. ▶Use the plastic folding stool for picnic outings, crafting, camping, and other recreational events. Manufacture Direct Pricing! Insuring you the best price. ▶The folding stools are made of UV protected high-density polyethylene plastic and has the capacity to hold up to 400 lbs in weight. The folding portable stool is scratch, stain, impact, and weather resistant.